abbr. emf, difference in electric potential, or voltage, between the terminals of a source of electricity, e.g., a battery from which no current is being drawn. When current is drawn, the potential difference drops below the emf value. ..... Click the link for more information. , or maximum output voltage, of a cell or generator by comparing it with a known voltage. (1) An electrical measuring device used in determining the electromotive force (emf) or voltage by means of the compensation method. When used with calibrated standard resistors, a potentiometer can be employed to measure current, power, and other electrical quantites; when used with the appropriate measuring transducer, it can be used to gauge various nonelectrical quantities, such as temperature, pressure, and the composition of gases. A distinction is made between DC and AC potentiometers. In DC potentiometers, the voltage being measured is compared to the emf of a standard cell. Since at the instant of compensation the current in the circuit of the voltage being measured equals zero, measurements can be made without reductions in this voltage. For this type of potentiometer, accuracy can exceed 0.01 percent. DC potentiometers are categorized as either high-resistance, with a slide-wire resistance ranging from 104 to 105 ohms (Ω) and a current ranging from 10-1 to 10-9 amperes (A), or low-resistance, with a slide-wire resistance below 2 × 103 ohms and a current ranging from 10-1 to 10-3 A. The higher resistance class can measure up to 2 volts (V) and is used in testing highly accurate apparatus. The low-resistance class is used in measuring voltage up to 100 mV. To measure higher voltages, up to 600 V, and to test voltmeters, voltage dividers are connected to potentiometers. Here the voltage drop across one of the resistances of the voltage divider is compensated; this constitutes a known fraction of the total voltage being measured. In AC potentiometers, the unknown voltage is compared with the voltage drop produced by a current of the same frequency across a known resistance. The voltage being measured is then adjusted both for amplitude and phase. The accuracy of AC potentiometers is of the order of 0.2 percent. In electronic automatic DC and AC potentiometers, the measurements of voltage are carried out automatically. 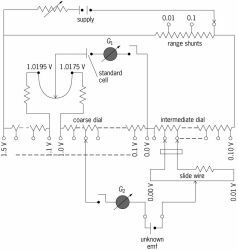 In this case, the compensation of the unknown voltage is achieved with the aid of a servomechanism that moves the slide along the resistor, or rheostat. The servomechanism is actuated by the imbalance of the two voltages, that is, by the difference between the compensating voltage and the voltage that is being compensated. In electronic automatic potentiometers, the results of measurements are read on dial indicators, traced on recorder charts or received as numerical data. The last method makes it possible to input the data directly into a computer. In addition to measurement, electronic automatic potentiometers are also capable of regulating various parameters of industrial processes. In this case, the slide of the rheostat is set in a position that predetermines, for instance, the temperature of the object to be regulated. The voltage imbalance of the potentiometer drives the servomechanism, which then increases or decreases the electric heating or regulates the fuel supply. (2) A voltage divider with a uniform variation of resistance, a device that allows some fraction of a given voltage to be applied to an electric circuit. In the simplest case, the device consists of a conductor of high resistance equipped with a sliding contact. Such dividers are used in electrical engineering, radio engineering, and measurement technology. They can also be utilized in analog computers and in automation systems, where, for example, they function as sensors for linear or angular displacements. Belevtsev, A. T. Potenlsiometry, 3rd ed. Moscow, 1969. Karandeev, K. B. Spetsial’nye metody elektricheskikh izmerenii, Moscow-Leningrad, 1963. Shkurin, G. P. Spravochnik po elektro-i elektronno-izmeritel’nym priboram. Moscow, 1972. Spravochnik po elektroizmeritel’nym priboram. Leningrad, 1973. Kasatkin, A. S. Elektrotekhnika, 3rd ed. Moscow, 1973. A resistor having a continuously adjusted sliding contact that is generally mounted on a rotating shaft; used chiefly as a voltage divider. Also known as pot (slang). A device for the measurement of an electromotive force by comparison with a known potential difference. The essential features of a general-purpose constant-current instrument are shown in the illustration. The value of the current is first fixed to match an IR drop to the emf of a reference standard cell. With the standard-cell dial set to read the emf of the reference cell, and the galvanometer (balance detector) in position G1, the resistance of the supply branch of the circuit is adjusted until the IR drop in 10 steps of the coarse dial plus the set portion of the standard-cell dial balances the known reference emf, indicated by a null reading of the galvanometer. This adjustment permits the potentiometer to be read directly in volts. Then, with the galvanometer in position G2, the coarse, intermediate, and slide-wire dials are adjusted until the galvanometer again reads null. If the potentiometer current has not changed, the emf of the unknown can be read directly from the dial settings. There is usually a switching arrangement so that the galvanometer can be quickly shifted between positions 1 and 2 to check that the current has not drifted from its set value.